Join us in cheering on our three Colas Cup Soccer teams as they play against each other in the battle to New Jersey. Sully-Miller Contracting Company and Blue Diamond Materials encourage your support for AB 812(Ma), a bill to promote the recycling of reclaimed asphalt pavement (RAP) into new pavements. Blue Diamond Materials, a member of the Sully-Miller group of companies, now has a Twitter feed. You can now get up-to-date news and information regarding Blue Diamond by following them on Twitter. Construction Materials Firm Builds Up Energy Savings Sully-Miller Contracting Co. works rigorously to satisfy the needs of its customers. Project Spotlight: Cedar Sinai Medical Center - Terra Pave., Inc.
Blue Diamond Materials teamed with Terra Pave, Inc. to repave an existing parking lot with environmentally friendly EcoMat® Warm Mix Asphalt at Cedar Sinai Medical Center. Blue Diamond Materials teams with Terra Pave, Inc. to retrofit an existing parking lot with environmentally friendly EcoMatTM Warm Mix Asphalt at Cedar Sinai Medical Center. 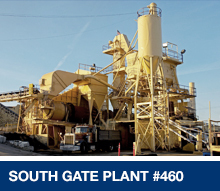 Blue Diamond Materials provided over 6,000 tons of EcoMat® Warm Mix for a Shamrock Paving job at the ExxonMobil Torrance Refinery. 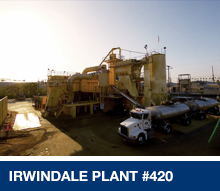 Blue Diamond Materials is leading the way in bringing Warm Mix Asphalt to Southern California. Congratulations to Blue Diamond Materials for being recognized by the Irwindale Chamber of Commerce during its 2009 Environmental Awards and Green Business Expo. On July 24, 2009, Blue Diamond Materials earned the Diamond Quality Commendation. On September 4, 2009, Blue Diamond Materials also earned the Diamond Achievement Commendation. 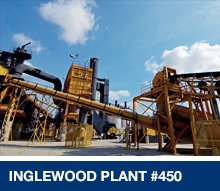 Blue Diamond Materials provides Hot Mix Asphalt materials for projects within the Los Angeles, Orange, Ventura, San Bernardino and Riverside County areas from 5 strategically positioned plant locations. Blue Diamond Materials started a plant recognition program in January 2009. The Irwindale Chamber of Commerce Environmental Committee awarded Blue Diamond Materials the 2008 Environmental Innovation Award for demonstrating smart green business practices. 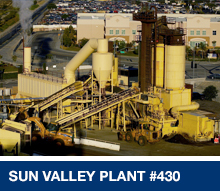 Production Kicks off with Our New Victorville Asphalt Plant! 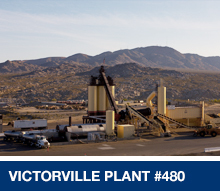 Our journey began in the summer of 2005 when the City of Victorville approached us with the possibility of the railroad wanting to bring a rail line through the middle of our Victorville plant.